thyssenkrupp Industrial Solutions, a leading partner for the engineering, construction and service of industrial plants and systems, has entered into a partnership with National Ports, an Australia-based developer and operator of large-scale floating port solutions, to make the operation of bulk carriers and materials handling equipment more efficient and environmentally friendly in shallow water ports around the world. 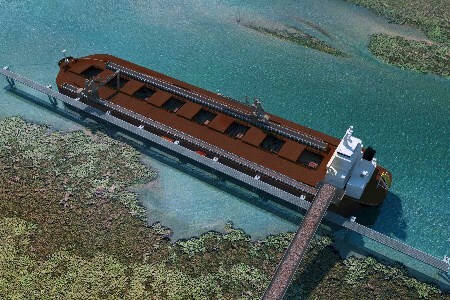 The cooperation is aimed at further developing and rolling out a new technology: the super shallow draft bulk carrier. This self-propelled vessel will open shallow draft ports to far greater tonnages with no dredging and very limited capital expenditure. The majority of global import and export ports for bulk material are geographically remote and not sufficiently dredged to handle modern bulk carriers. Such bulk carriers with a capacity of 180 000 DWT usually require a draft of around 19 metres, including clearance under the keel. Most ports have a draft of only 14 metres, or even less. At the same time, dredging is very expensive and costs increase exponentially when dredging of hard materials is required, not forgetting its negative impacts on the marine environment. With the new super shallow draft bulk carrier, thyssenkrupp and National Ports offer mining companies and port operators around the world a fast and efficient bulk material handling solution for shallow water ports. With up to 185 000 DWTy on a 14 metre draft, the new system will be able to transit ports with limited water depth. It will be capable of self-unloading its cargo at a rate of up to 10 000 tph into bulk carriers of any size (including the Valemax with a 400 000 DWT capacity) or directly at the destination port in a safe and environmentally friendly manner. The new bulk carrier can be loaded from any ocean-going vessel or directly from the land side via shore conveyors, thus limiting capital expenditure for new port infrastructure. Mine and port operators can charter the system on a per ton basis. The super shallow draft bulk carrier is technically based on a conventional bulk carrier, supplemented by so-called sponsons (attached to both sides of the bulk carrier). These provide the ship with additional flotation enabling it to operate in fully loaded condition in very shallow waters.